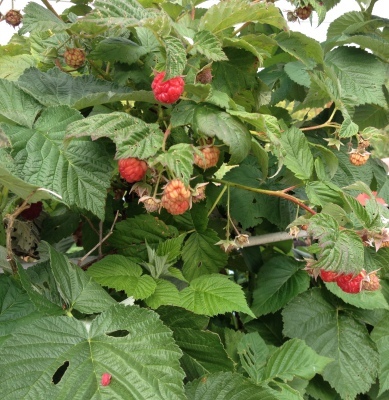 Raspberries are a productive, delicious fruit for the home garden. They generally take three years before they produce a good crop, and they need regular, annual pruning to remain productive, but this is easily accomplished when you know how it’s done. The roots are perennial, but the canes are biennial (they live for two years); fruit is borne on the second-year canes. In late summer or fall, once they have finished producing fruit, the two-year-old shoots should be cut at the base (they are easy to spot because they turn brown), and any weaker first-year canes should also be removed. Red raspberries will send up suckers, which can easily be dug up to produce more plants. ‘Fall Gold’ – A yellow everbearing variety with large, sweet flavoured berries. Yellow raspberries aren’t bothered as much by birds, who assume they’re not yet ripe. ‘Heritage’ – not quite as cold-tolerant as Boyne or Nova, Heritage offers a long growing season wherein it bears heavy yields of high-quality fruit.